On November 15, we traveled as representatives of the Harvard Health and Food Law and Policy Clinics to Jackson, Mississippi for the 9th Annual Southern Obesity Summit. 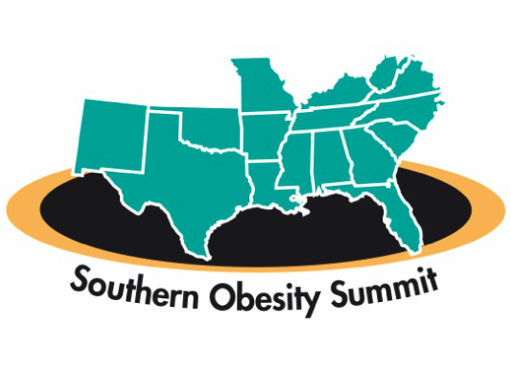 The Summit is the largest regional event that focuses on obesity prevention in the United States. It draws participants from 16 Southern States as well as advocates from around the country. Attendees included policymakers, community-based organizations, health care providers, and members of other public health organizations. The three-day Summit kicked off at the Mississippi Museum of Art with a delicious meal featuring local Mississippi foods prepared by the Museum’s Executive Chef Nick Wallace. The next two days consisted of panels and work groups, which were interspersed with dance parties and other fun activities to get everyone moving. The panels and work groups covered topics such as school foods and nutrition, food access, obesity research, and physical activity. Ona Balkus, a senior clinical fellow with the Food Law and Policy Clinic, presented about procurement of local foods, describing its importance and its potential for promoting sustainable, healthy food systems. Katie Garfield, a clinical fellow with the Health Law and Policy Clinic, also presented about the Clinic’s exciting work with food banks and food pantries as supporters of health promotion in their communities. For us first-time students in the Food Law and Policy Clinic, the Summit gave us an exciting opportunity to hear from many influential stakeholders whose innovative initiatives are already addressing the obesity crisis. We were able to learn about programs focused on food-related health outcomes in schools, health care facilities, and the community as a whole. Many of these efforts have informed and are often at the forefront of our clinic research, which strives to provide guidance for communities that want to improve the quality of their food systems. Specifically, we are working this semester to update the FLPC’s Good Laws, Good Food local food policy toolkit, which provides a menu of policy options to communities working to improve their food systems. The Summit provided a plethora of ideas and innovations to incorporate into the updated toolkit to share with other communities around the country. We enjoyed being able to connect with individuals who serve as champions in their respective fields, as it is these individuals that we hope to reach through our work and learn from in the process. To stay up to date on FLPC’s projects, follow us on Facebook and twitter. How do you solve a problem like antimicrobial resistance? This was the question posed and main focus of “Drugs, Animals, and Food: Law & Policy of Antibiotics in the Food System,” the second annual joint conference of the Harvard Food Law Lab and UCLA’s Resnick Program for Food Law and Policy, held on Oct. 23. The conference brought together advocates and scholars from several disciplines to discuss the regulatory issues that exist at the intersection of animal agriculture and human health. To understand the importance of these questions is to understand the scope and size of the problem. Lance Price, a professor at George Washington University’s Milken Institute School of Public Health, offered a compelling explanation of how superbugs– microbes that are resistant to traditional antibiotics due to global overuse – develop. Doctors in the U.S. prescribe around 8 million pounds of antibiotics to humans per year when we, say, get strep throat. In the animal agriculture industry, producers administer around 32 million pounds of antibiotics every year; 20 million pounds of which are the same drugs used to treat humans. Such copious use of antibiotics renders them ineffective if microbes become resistant to them. The problem is compounded when those antibiotic resistant microbes make people sick. Why do producers administer so many pounds of antibiotics, then? For one, antibiotics make animals grow faster, so producers have historically incorporated drugs in animal feed as a way to speed up production. One useful term to explain the reason for such high use is production diseases, which describes the sort of bacterial mess that comes with unsanitary, densely concentrated live animals. Such an industrialized system – one that some might argue is the result of high demand for animal products – might explain the rationale for the overuse of antibiotics. Instead of de-intensifying animal agriculture, or changing production methods in such a way that would be cleaner or more humane, the solution that has become an industry standard is to pile on the antibiotics. Different examples can prove helpful in understanding how politics, black letter law, consumer demand, and institutions all can play a role in finding a solution. Anna de Klauman, Minister Counselor of Food & Agriculture for the Embassy of Denmark, explained how Denmark’s ban on growth-promoting antibiotics did not dramatically change the bottom line for profits of the huge, export-based pork industry there, and more involved cooperation between veterinarians, farmers, and regulators has resulted from a “Yellow Card” initiative, which focuses on the most severe users of antibiotics in the pork industry. The differences between American and Danish agricultural practices and political norms, however, means that the Danish approach cannot be emulated so neatly. Speakers also discussed the role of other potential policy measures – a tax on antibiotics, or incentives to change production methods, for example – as effective, but politically fraught ways the agribusinesses producing meat in this country might be regulated. Professor Lisa Heinzerling of Georgetown University Law Center gave a rousing presentation about how court interpretation of the definition of an “adulterant” has had far-reaching consequences in how the FDA can (or cannot) regulate food tainted with superbugs. The role of state laws and agencies in regulating antibiotic use was also discussed, particularly in light of recent antibiotics legislation out of California. Beyond the law, speakers stressed the other forces to wield when thinking about curbing antibiotic resistance. Private corporations, especially fast food restaurants, have claimed to commit to reducing antibiotic use in their products, though these claims are hard to verify, track, or ensure in the long term. Chipotle’s Program Manager for Food with Integrity Josh Brau discussed the experience of the restaurant committing to only serving “food with integrity,” and how restaurants can have a significant impact on the supply chains they source from, even without legal intervention. Stephanie Tai, Associate Professor of Law at University of Wisconsin Law School, recognized the unprecedented interest in the role of quasi-governmental groups, like the President’s Council of Advisors on Science and Technology, and how their attention to the issues is a cause for optimism, even if the effectiveness of their findings has yet to be determined. Clearly, the nation is facing a complex situation. As long as we use antibiotics, we need to think about antibiotic resistance. The “Drugs, Animals, and Food: Law & Policy of Antibiotics in the Food System” conference provided a great introduction to a complex issue and and at least some hope for how to go about constructing a robust legal framework to help mitigate it. The Food Law and Policy Clinic (FLPC) and the Health Law and Policy Clinic (HLPC) are now accepting interns for summer 2016. The summer internship program will run from Monday, May 23rd to Friday, July 29th, for a minimum of 40 hours per week. There is some flexibility with regard to start and end dates as long as summer interns make at least an eight-week commitment. Summer interns in the Food Law and Policy Clinic (FLPC) have the unique opportunity to engage in action-based learning to gain a deeper understanding of the complex challenges facing our current food system. Interns get hands-on experience conducting legal and policy research for individuals, community groups, and government agencies on a wide range of food law and policy issues, and are challenged to develop creative legal and policy solutions to pressing food issues, applying their knowledge from the law school classroom to real-world situations. Students will have the opportunity to develop cutting-edge policy recommendations at the state and national levels in the legislative, litigation,and regulatory arenas. Projects involve informing both national and state level implementation of the Affordable Care Act through regulatory comments and analysis, providing law and policy analysis to national and state coalitions advocating to protect the Medicaid program, developing a national litigation strategy for anti-discrimination and improved access efforts, and investigating best practices for initiatives to increase access to treatment and service programs serving vulnerable populations. For further details on both clinics and the program, visit the Summer Internship Program page. The federal government has recognized the importance of food donation and provides an enhanced tax deduction to incentivize certain businesses to donate food. 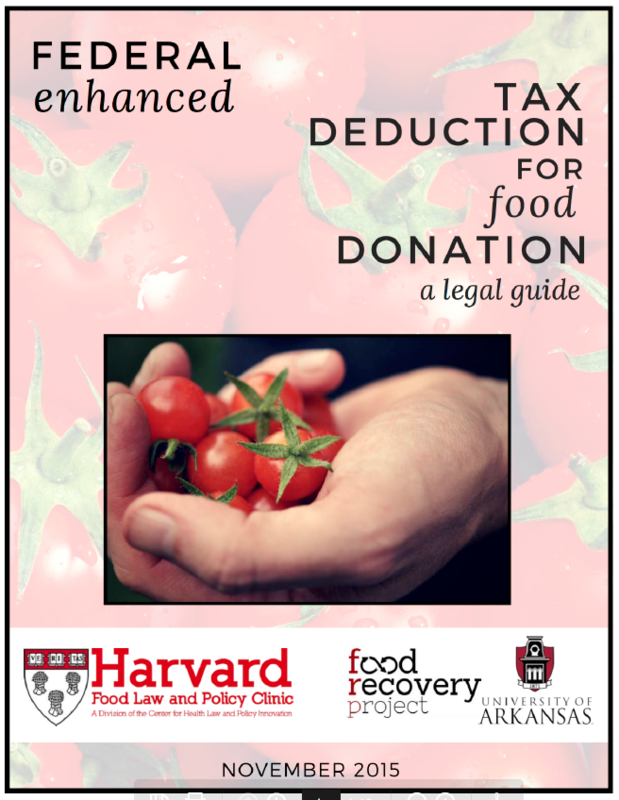 In “Federal Enhanced Tax Deduction for Food Donation: A Legal Guide,” the Harvard Food Law and Policy Clinic and the Food Recovery Project at University of Arkansas School of Law provide an important resource for food businesses and food recovery organizations to determine whether a food donor is eligible to receive the enhanced deduction. While all businesses may claim a general federal tax deduction for food donation, currently only C corporations are eligible to receive the enhanced deduction. Congress has expanded eligibility to receive this enhanced deduction to other businesses via short-term extensions in the past, but at this time only C-corporations are eligible. Businesses seeking to receive the enhanced deduction must also meet several other requirements to be eligible for the enhanced deduction, including donating to certain charitable organizations and meeting quality standards for their donated food. These and other requirements are described in detail in our guide. Image taken at the Dudley Greenhouse in Roxbury, MA. I learned of the Harvard Food Law Student Leadership Summit from a multitude of sources over the summer. The first was from my summer co-intern. The second was from one of the attorneys for whom I was working. The third was from a law school friend back in DC. While I was grateful that each of these people reached out to me and encouraged me to apply for the Summit, I wasn’t surprised they had done so. Past experience has taught me how welcoming and inclusive the food law community can be. As I filled out my application, I wondered if that spirit of collaboration would be present at the Summit. What would it be like to meet with so many students interested in food law, all in one place? How engaged and excited would the speakers be? And what would we take with us after we left that weekend? When I arrived at the Summit, I knew instantly that a cooperative spirit wasn’t just “present” like I had hoped. It was the core of the gathering. Professionals and academics dined at the same tables as Summit participants, discussing their own work and listening to and encouraging student interests. Students engaged each other, sharing past work experiences, advice on class offerings, and what was most meaningful to them about food law. Everyone there was intent on forming a food law community, a network of people they could reach out to in their professional lives who were equally passionate about forging a career in this rapidly expanding area of law. Post-Summit, I’ve seen that sense of community continue between both professionals and students, from Summit participants coordinating informal food law gatherings in their geographic areas to Summit speakers giving their time at local law schools. Participants not only recognize the importance of maintaining the connections we’ve made with each other, but also genuinely want to continue and expand the dialogue to others with similar interests. I am grateful to be a part of this professional community that cultivates a spirit of inclusion. When participants look back on their careers, I hope they remember the Summit as a pivotal moment in time when connections with community members grew. On November 11, Marketplace reported on a new study from Avalere examining patient access to HIV medications in the 2015 Silver Qualified Health Plans (QHPs) of the Affordable Care Act. This study draws attention to major issues around coverage and cost of HIV medications in these plans and reinforces findings by Harvard Law School’s Center for Health Law and Policy Innovation (CHLPI), which has worked on health care reform implementation and monitored trends in state Marketplaces for the past two years of open enrollment. CHLPI’s director Robert Greenwald spoke with the senior reporter for Marketplace’s Health Desk, Dan Gorenstein, about CHLPI’s work and the implication’s of Avalere’s study. “Perhaps the clearest example, said Harvard’s Robert Greenwald, is how insurers are switching consumers from a flat copay fee to co-insurance, where a person pays a percentage of their medication. ‘The insurers are saying, “Oh, we can’t keep people off, we can’t charge people higher premiums. I’ve got it. Let’s change the way we do co-insurance,”‘ he said. For example, Greenwald said some consumers went from a once-a-month $50 copay to a once-a-month $600 co-insurance payment for the same prescription drug. And while consumers benefit from out-of-pocket limits, he said consumers must come up with more cash up front. Read the full article, “Researchers: Insurers are steering some patients away” online. Carmel Shachar, clinical instructor at law at Harvard Law School’s Center for Health Law and Policy Innovation, explained the implications of the new guidance notice from the Centers for Medicare and Medicaid Services (CMS) on access to Hepatitis C medications in an opinion piece for TheBodyPRO.com, a leading online resource for health care professionals on HIV/AIDS and related diseases. Read “Powerful Hepatitis C Notice From U.S. Government Will Expand Access to High Cost Meds” in full here. On November 5, 2015, Wall Street Journal released “Federal Officials Warn States on Hepatitis C Drug Restrictions” about the federal government’s strong warning to states with Medicaid programs that have placed unreasonable restrictions to accessing the Hepatitis C (HCV) cure. The article by Joseph Walker reviews the guideline Notice released by the Centers for Medicare & Medicaid Services (CMS). Read “Federal Officials Warn States on Hepatitis C Drug Restrictions” in full. This story was written and originally posted by Drake University Law School on November 6, 2015. 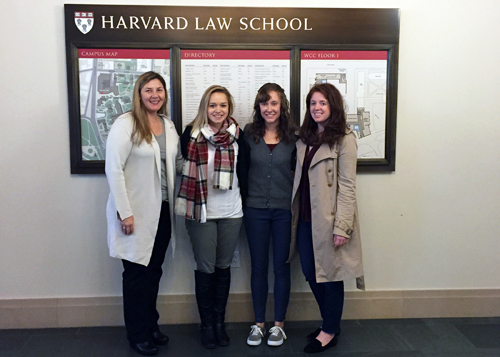 Drake Law students Caitlin Andersen (3L), Natalie Ginty (3L), Sable Joseph (2L), and Kelly Nuckolls (3L) attended the first-ever Food Law Student Leadership Summit at Harvard Law School in October. They were among 100 students from more than 50 law schools around the country selected to participate in the event. Hosted by Harvard’s Food Law and Policy Clinic, the summit brought in national experts – including Drake Law School’s Neil Hamilton, director of the Agricultural Law Center and Dwight D. Opperman Distinguished Professor – to discuss issues related to the environment, health, food safety, and food waste. Students also worked together in small groups to develop strategies for addressing some of society’s most pressing food law and policy concerns, such as regulation of concentrated animal feeding operations or soda taxes. “I learned how diverse the perspectives are on the subject, and how important each of these perspectives are in reaching policy structures that will affect change,” Andersen adds. The summit also offered tours designed to provide a diverse perspective on issues in food law. 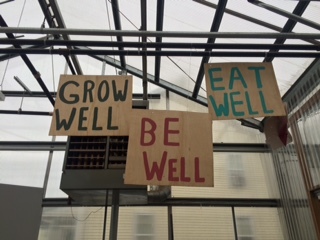 Groups of students visited not-for-profit organizations such as Community Servings and Daily Table, as well as a kitchen incubator and a community garden in a lower income area of Boston. In addition, the attendees worked on strategies for enhancing interest in food law among law students. Nuckolls was a speaker on a student leadership panel to share ideas for starting a student organization or getting a class in food law offered at schools. Nuckolls says the other students on the panel had all founded student organizations on their respective campuses, while Drake’s agricultural law organization has been around for more than 30 years. Nuckolls says her biggest takeaway from the summit was how many opportunities Drake Law students have to learn about food and agricultural law compared to other law schools. In addition to various courses in the subject, Drake also has a Certificate in Food and Agricultural Law as well as strong student involvement in the Agricultural and Environmental Law Association and the Drake Journal of Agricultural Law. Andersen agrees that the courses offered at Drake Law School, as well as her involvement in student organizations, has supplemented her understanding of food and agricultural law. “I walked away from the summit really appreciative of my time at Drake Law, which has allowed me to be exposed to agriculture and the food system,” Andersen says. Harvard University graduate Kelly Lee Morrow joined the Center for Health Law and Policy Innovation and the Harvard Food Law and Policy Clinic for the Third Annual Food is Medicine Symposium on October 29, 2015. Read her blog post about the symposium, originally posted at Kelly’s Bright Light on Monday, November 2, 2015. Thursday, October 29, I attended the Food Is Medicine event hosted by The Center for Health Law and Policy Innovation of Harvard Law School, the Harvard Food Law and Policy Clinic, and Community Servings. They had guests from three different areas of the health and food industry speak about innovations pertaining to Food Is Medicine. The three areas were The Role of Retailers in the Food Is Medicine movement, How the Healthcare System is Integrating Nutrition Programs to Improve Population Health, and Make the Case for Food Is Medicine with Data and Cutting Edge Research. What struck me is that each presenter spoke about their area in the movement with great enthusiasm. It was apparent to see their excitement about being able to truly help, heal and serve people with the power of wholesome food. Though they had a shared passion, it was equally interesting to see how these people were making change for the same big picture movement, but coming at the issue from different angles. Annika Nielsen spoke about a pilot store in a low income area outside of Boston called Daily Table. Using donated foods, fresh produce and prepared meals they have been able to provide extremely low cost, healthy meals to low income and food stamp using citizens. Low income families are generally unable to afford healthy food, if any food at all. Having this option allows them to use food to prevent illnesses that run rampant in individuals who live at this socioeconomic status. Nielsen spoke of individuals coming in, tears in their eyes, so grateful to be able to afford this healthy food. David Waters of Community Servings is coming from a post-diagnosis perspective. After individuals are diagnosed with an illness (the company was started exclusively serving those with HIV and has now expanded) wholesome meals are delivered to them, made specifically to target their health needs. These food health programs are being shown to not only be incredibly effective, but also much more cost effective than hospital visits and medication. Waters said with the cost of one hospital visit an individual can be fed for months instead. Jody Adams, Chef and member of Board of Directors for Partners in Health, spoke about her experience, and her story effected me the most. She was involved in not only raising money to build hospitals in Haiti, but she went down and first hand taught the Hospital chefs how to cook wholesome foods for the patients. They said patients would come in sick, and after eating their food would get better and not want to leave. Adams said patients in these hospitals are eating better than patients in hospitals in the Boston area (not that there is a high standard, hospital food here is appalling). More than just being a hospital, they have programs there to help people with their homes, food, education and have found that helping people in these areas has helped to improve health across the board. These are just three of the speakers that presented to a very full room of eager participants. 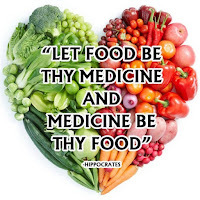 Overall I very pleased that the concept of Food being Medicine is catching on. 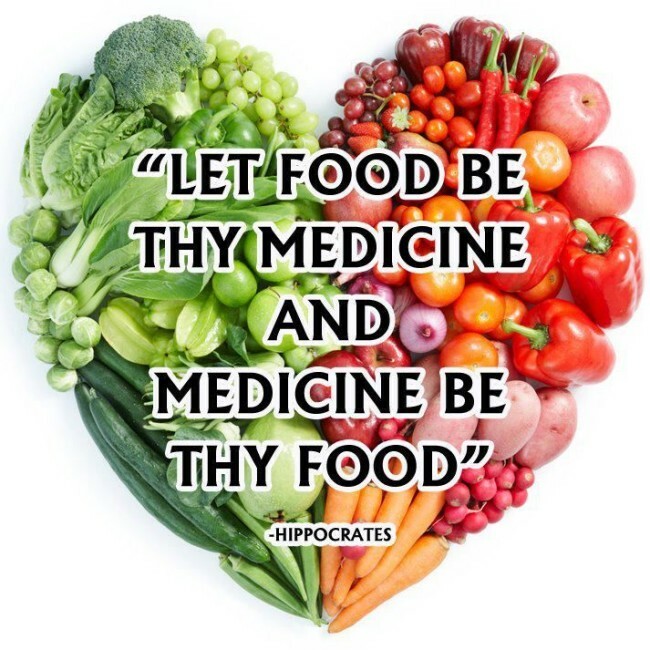 That Hippocrates, the father of modern medicine’s, prescription is being put into action in the modern world. I walked out of the door with a feeling that this is just the front of the wave, and I can’t wait to see where it goes.